NEW DEVICES GENERATE RENEWABLE ENERGY FROM EVAPORATION | "Global Possibilities"
Evaporation is a key component of the Earth’s water cycle, and one of the world’s most dominant forms of energy transfer—and it’s believed that as the climate warms, evaporation rates will increase and result in more moisture in the lower atmosphere. Yet the power of evaporation has rarely, if ever, been utilized for energy generation. But one lab at Columbia University is seeking to change that. By harnessing the natural properties of spores—and their responses to humidity—they have created two devices that generate renewable energy from evaporation. The lab hopes that one day these devices could be scaled up to produce electricity from large floating power generators, or from rotating machines akin to wind turbines that sit above water. Ozgur Sahin, Ph.D is lead author of a paper published in Nature Communications which details the new technology. The study builds upon his previous finding that bacterial spores will expand and contract in response to changing humidity, performing in a very similar way to a muscle. What he and his students considered was that the performance of these spores could be harnessed to utilize evaporation and generate movement and energy. The lab developed two devices; the first is a floating piston driven engine in which the spores are glued to either sides of a thin strip akin to cassette tape. When exposed to dry air the spores contract, the tape forms a wavy shape and whatever it is attached to is tugged upon, and when exposed to humidity, the tape straightens out. This tape was placed within a plastic box that floats in water and has shutters atop it. When the tape registers enough humidity to fully straighten, the shutters open, releasing the humidity and causing the tape to shrink, once again closing the shutters. When the box was attached to a generator, the piston motion produced enough energy to create a flicker of light. 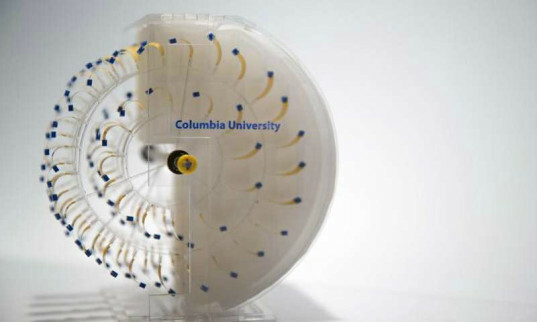 The second—dubbed the Moisture Mill—looks rather like a turbine, and features dots of the spores placed on the ends of small pieces of tape, that are attached to a wheel. Half of the wheel is enclosed in a plastic case—where the tape is exposed to humidity and straightens, while half the wheel is left open, where the tape curls. When this wheel was attached a small toy car-like set up, the energy harnessed was enough to propel the vehicle forwards. The researchers believe that this could power a car, or that a much larger version could be placed on top of water to generate as much electricity as a wind turbine. Moreover, Sahin claims that by harnessing evaporation, this form of renewable energy could address both the issues of climate change—keeping the moisture closer to earth—while providing a completely clean form of power.